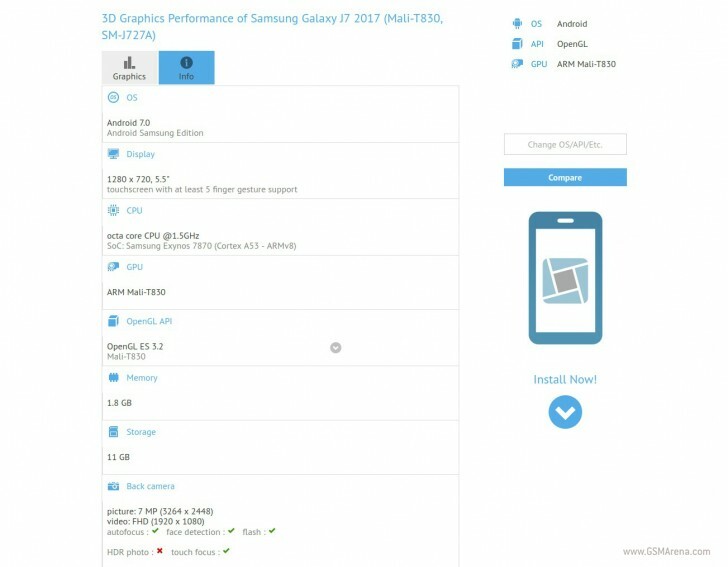 The latest yet-unannounced Samsung model to be put through the paces of GFXBench for Android is the Galaxy J7 (2017). Its GFXBench outing follows that from Geekbench a while back, and the smaller J3 (2017)'s GFXBench run from last year. According to the benchmark's data, the Galaxy J7 (2017) will come with a 5.5-inch 720p touchscreen, the Samsung Exynos 7870 chipset (with a 1.5 GHz octa-core Cortex-A53 CPU and ARM Mali-T830 GPU), 2GB of RAM, 16GB of storage, an 8MP rear camera, a 5MP selfie snapper, and Android 7.0 Nougat running the show. Interestingly, the Galaxy J7 (2017) model that passed through Geekbench earlier features Qualcomm's Snapdragon 625 SoC instead. That means we'll probably see different versions of the phone with different chipsets. One of them will be sold in the US by AT&T, Verizon, and US Cellular, a past leak told us. Hopefully the Galaxy J7 (2017) launches soon, since it's already been certified by the FCC and the Bluetooth SIG. Well, I own a ZenFone 3 ZE520KL and it runs most graphics intensive games. SD 625 FTW! I already own this phone. I purchased it through Tmobile mid-year last year. I totally love it.